See also original COLHOST 4 plan location on their website! From Small Business hosting plan you can design your website in just 3 steps without any knowledge in web design, we have different CATEGORIS for all types of pages - See more . We perform backups daily courtesy of your information for 7 days on a dedicated server. You may request backup your files if for some reason lost or changed. If you are not satisfied with the hosting service within 60 first calendar days, we will refund your money without questions or restrictions - See more . Each server is monitored every 10 seconds for 3 FireWalls protected, Detector Intruders constantly scanned by a system rigorously Anti Malware and configured to prevent attacks from the Internet. All modern hosting servers are Xeon processors, 48-76GB RAM and hard drives in RAID. Unlike other companies in the sector all servers are themselves. We are fans security and stability of our servers, we know what we do and why we offer the best support in the country, we have engineers Red Hat (Red Hat Certified Engineer - RCHE) certificates in cPanel. We've been 11 years in the market. Give yourself your hosting account (create email accounts, upload your page) and install dozens of open source applications as (Joomla, Wordpress, shopping carts, etc) with a couple of clicks code. See demo of cPanel . 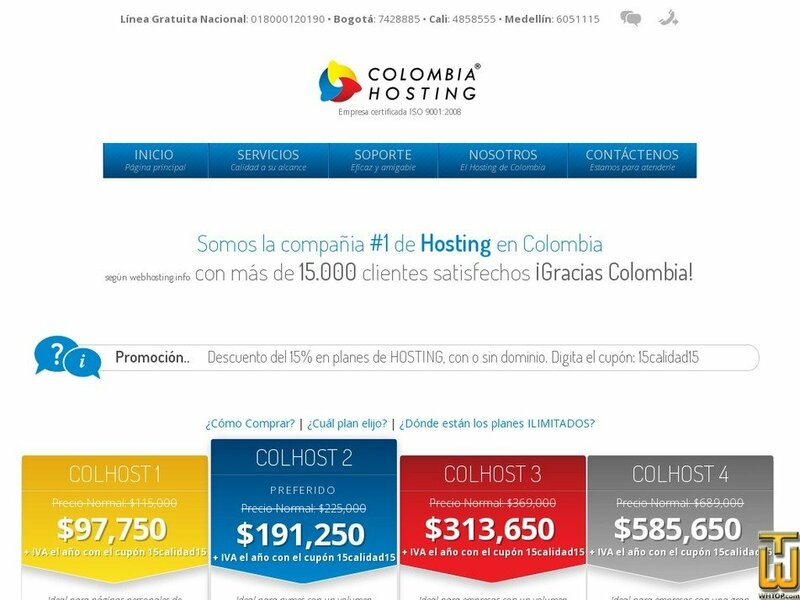 More than 15,000 customers have chosen ColombiaHosting as your service provider Hosting and Domains thanks to the quality and support we provide to our users. We have offices in Cali and Bogota. While other solutions emrpresas offer free webmail as Horde, Squirrelmail and Roundcube. We additionally offer a commercial and professional tool with 100% ajax interface and the ability to personalize it with your company logo. See demo webmail . The domains you register with us will be registered in your name and your information may be found doing a whois the domain. Through our administration panel you can point your domain to another provider at the time you want. It is a technology developed by ColombiaHosting to prevent the IP addresses of our servers are reported blacklisting. This allows emails sent from your plan Hosting reach the inbox and not the spam folder. This tool features check blacklists, rotating IP addresses, blocking SPAM messages. avoiding spam , etc. It is a feature on our servers for hosting service is faster and more stable. By having TurboSSD your server will have hard drives Solid State , high performance enterprise class RAID, these hard drives are 10 times faster and 50 times more stable than a traditional hard drive. Sending mass emails it is not allowed. Prices on this page are in force. These plans include a satisfaction guarantee of 60 days. Prices have VAT included, it is necessary adding them to 16%. The coupons apply for the first year of service. Download a quote for these services, giving click here .